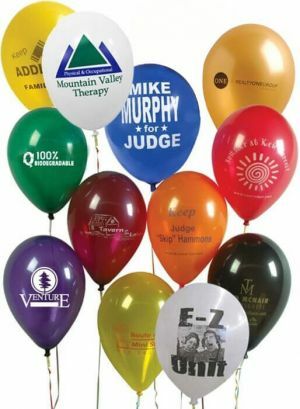 PromotionChoice.com carries 100% fully biodegradable custom latex balloons that ranges widely in styles, colors, and sizes, so that you can pick exactly what fits your needs best. 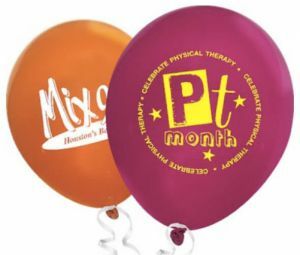 These custom latex balloons ranging from 9 inches to 18 inches can be imprinted with your logo, text, artwork, or design. Buy top quality personalized latex balloons with us at cheap wholesale prices in bulk today. All of our wholesale balloons are printed and shipped out from within the USA! Nothing brings out the fun and exictement from a party more than custom printed latex balloons from Promotion Choice. Our eco-friendly and completely biodegradable personalized latex balloons are made and printed in the USA. 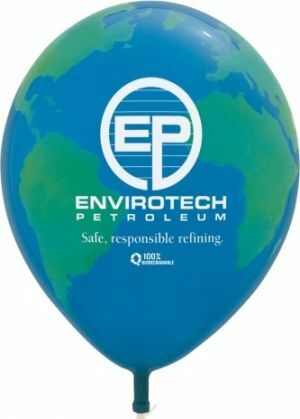 Party and have fun with a clear conscience that you are using an environmentally friendly product and let those balloons fly, soar, and promote your brand name or logo proudly. 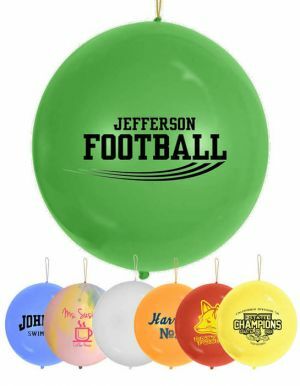 Our custom printed latex balloons have low prices and are available in many fancy colors across the color spectrum. 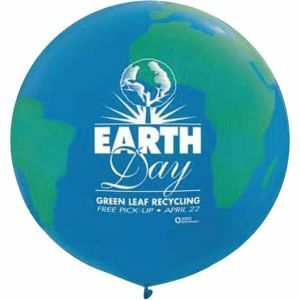 Our variety is also impressive, which include biodegradeable custom latex balloons, promotional punch balloons, printed heart shaped balloons, and custom globe or Earth balloons which could be so appropriate for events like Earth Day. We have practically every color and type of balloon that will suit your company function, party theme, public relations event, or marketing campaign. 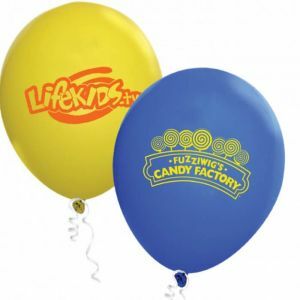 Our wholesale imprinted latex balloons also come in various sizes, from as small as 9" to 18". Our most popular sizes are the 9" and the 11" balloons. The 11 inch imprinted latex balloons are considered the standard size preferred by most customers. Printed latex balloons are so versatile and can be used for so many different purposes. Dentists especially love giving out logo balloons to kids, whose face lighten up immediately when they see a bright shiny balloon in their hands. And no parties today are complete without some promotional balloons with a custom message, be it a simple "Happy Birthday" message or a nice one color photo of whomever the guests are celebrating or honoring. Companies love the use of personalized balloons particularly in their company colors to get attention, signal fanfare, and make their event one for all attendees to remember. Do note that our custom balloons with logo ship deflated. Shipping costs will be prohibitive to ship party balloons inflated. If these customized latex balloons were to be shipped inflated, they will lose their lustre and the helium by the time they arrive at their destination. Our quality wholesale latex balloons hold helium for an approximate 12 to 16 hours. You can get helium tank rentals by conducting a quick local search in your area. Some big department stores also sell smaller size helium tanks that can inflate a smaller quantity of personalized latex balloons (perhaps 50 pcs of 11" balloons). Place an order for logo latex balloons with us today! 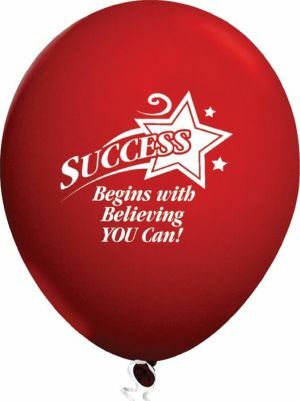 One of our best sellers for a reason, promotional latex balloons is going to help you market your company or your event so well, you will come back for more. We have a huge army of repeat customers because the quality of our helium balloons, the quality of our print latex balloons, and our friendly and helpful customer service, make doing business with us so easy and convenient. We hope to work with you soon!